The Annual Berghoff Oktoberfest is “the largest, longest-running Oktoberfest in Chicago!” Make plans to attend the 28th annual Berghoff Oktoberfest. WHEN: September 11 – 13, 2013. There is free daily admission from 11:00 a.m. – 9:00 p.m.
WHERE: The John C. Kluczynski Federal Plaza with traditional German musical performances and featured nightly shows with some of Chicago’s favorite bands. View or print the Berghoff Oktoberfest 2013 flyer, including the special Oktoberfest menu! Two Pub Crawls, each featuring three German import beers, German food and live music are scheduled for September 26th and October 3 starting at 6:30 p.m. 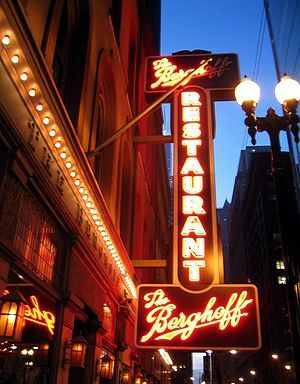 The Crawl starts at The Berghoff and continues to Chicago Brauhaus, and Prost! Guests will be transported on a private trolley. Cost: $36-$46 (early ends 9/11). For more information click here.